(105 field trials during 2001-2007). In 1960, herbicides made up 20% of all used chemical pesticides with total value of 0.85 billions USD, in 1980 herbicides did 41% at the total expenses on chemical plant protection of 11.6 billions USD, after next 20 years, in 2000, herbicides took 52.1% of total expenses of 30.7 billions USD, and this tendency of growth appears to be stable. It is clear, that there is no serious alternative to application of herbicide to control weeds now. However, the most important problem of herbicide application is the selectivity of their action. Every agronomist knows, herbicides (regarding to their effectiveness) are the most unpredictable ones among all other groups of chemical pesticides (seed treatment agents, fungicides, insecticides, etc.). 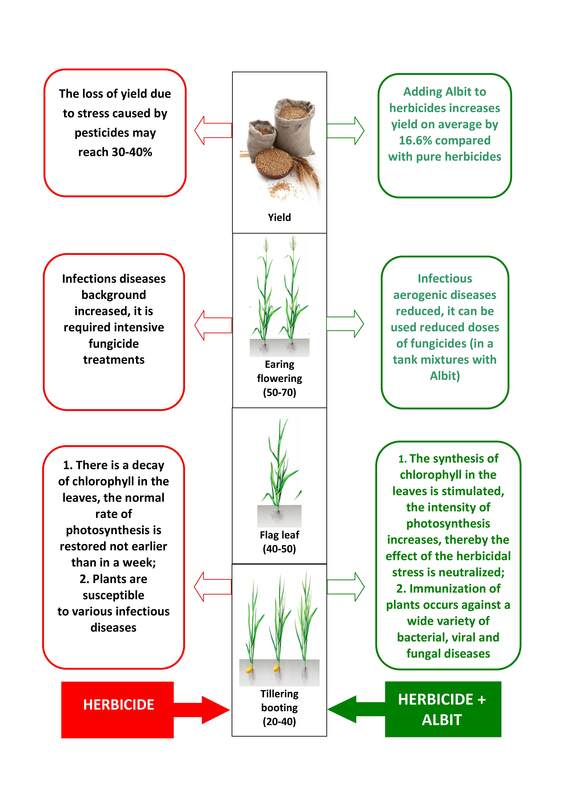 In biological point of view, crops and pathogenic fungi are considerably more different than crops and weeds. Control of weeds is based on hitting certain targets which are common for all plants (CoA–carboxilase, acetolactatsynthase, photosystems I and II, biosynthesis of caratinoids, cell division, etc.) Therefore, selectivity of herbicides is considerably lower, than that of fungicides, and herbicides cause considerably more severe stress on main crop than fungicides. This stress activity of herbicides (despite beneficial effects of weeds elimination) might lead to yield losses up to 50%. After herbicidal treatments, one can note delay in main culture growth, withering and yellowing of leaves, dramatic increase of plant sensitivity to diseases. In some cases, application of highly active herbicides or herbicide mixes leads to practically total suppression of plant growth, and only well timed rain or treatment with powerful antistressor are able to save the yield. Therefore, application of safeners (antidotes) in combination with herbicides has been becoming more and more widespread in recent time. Multiple field trials demonstrated that Albit relives stress effect of herbicides on plants. According to data of All-Russia Institute of Plant Protection and Orenburg State Agrarian University (2004, 2005), Albit decreases herbicidal stress on cereals by 5-38%, i.e. saves up to 40% of yield. According to calculations of All-Russia Institute of Plant Protection (2004), each rouble invested to application of Albit in combination with herbicides brings more than 5 roubles of profit. 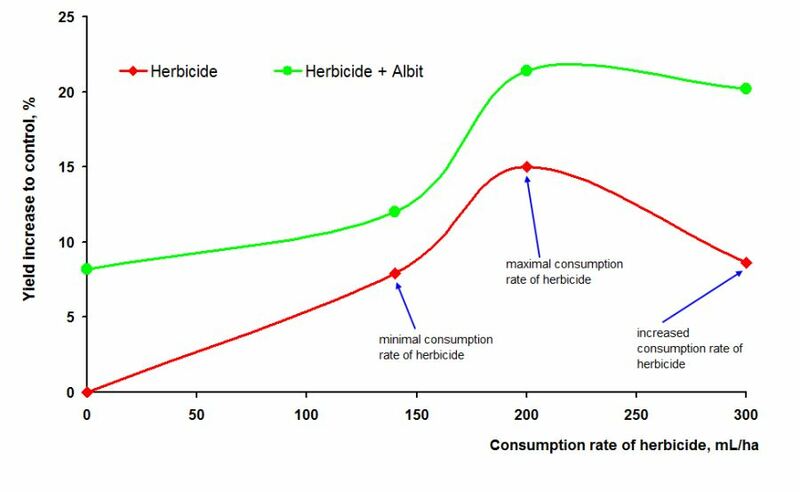 Application of Albit with herbicides allows to increase crop capacity by 16.6% in comparison with using pure herbicides, seed treatment with Albit before herbicide application – by 23.1% (according to average long-term data of field trials on various crops). Albit can be applied together with herbicides (in a tank mixture), and after 1-5 days after their using (for removal of excess stress effect). Also seed treatment is effective. Seed treatment with Albit makes plants resistant to herbicide stress (Fig.1). Albit, in contrast to the majority of similar anti-stress biostimulants, officially has the status of an antidote, which is confirmed by numerous studies, scientific publications and regulations. Not each growth biostimulator is an antidote. The most important thing is that antidote should not reduce the protective effect of the herbicide against weeds. For example, in 2015, the effect of a herbicide mixture with Albit and another known growth regulator was compared in the fields of sugar beet (Volga hybrid) in LLC Stepanovskoye (GK Dominant, Tambov Region). It has been shown that the efficacy against weeds persists in herbicides and when combined with a standard, and with Albit (Figure 2). But the stress effect of herbicides on sugar beet plants was taken only by Albit (Figure 3). The oppression of growth and development of culture in the version with the standard lasted 12 days, the yield was 460 c / ha. In the variant with Albit - 577 c / ha. Separate application of Albit and herbicides is due to opinion of some specialists, who apprehend, that Albit might decrease efficiency of the herbicide. However, there are no experimental proofs of this suggestion. Albit stimulates wide range of metabolic reactions in plant cells; as a result, plants that are slightly suppressed by herbicide (main crop) overcome stress, while in considerably more suppressed weeds Albit intensifies processes of lysis and destruction, since these processes are more typically occurring there. Thus, Albit stimulates solely growth of weeds against which the herbicide is ineffective. This assumption was confirmed in tests of All-Russia Institute of Plant Protection (2004). If applied herbicide (or mix of herbicides) is effective against all available weed species, its combination with Albit will just increase herbicidal effect. Additional treatment with Albit after application of herbicides can be effective mainly for elimination of herbicide overdose consequences. Application rates of many modern herbicides, for example, metsulphurones and sulphonylurea–based ones, are quite small (several grams per hectare), that increases probability of overdosage. By using Albit, farmers managed to recover growth of sugar beet and soybean after ‘burning’ them with too high doses of herbicides in Voronezh, Tambov oblasts, and Krasnodar krai (2001-2003). Noteworthy field trial in Lipetsk oblast, Russia (Agricultural Production Cooperative "Grachevsky" Usman district, 2004), when Albit was applied on winter wheat together with herbicide, and then, after a short period of time, it was conducted a second additional spraying with pure Albit. As a result of a single treatment with Albit on vegetation, yield increasing to the control was 0.45 t/ha, during double treatment - 1 t/ha. Yield increasing at a double application compared to a single one was 15.1%. Apparently, the high yield could be explained by the fact that under conditions of double application of Albit its anti-stress activity towards to herbicide was the highest. The higher antidote activity of double spraying with Albit of cereals (once in the tillering stage in combination with herbicide, the second time - in stages from booting to flowering) was confirmed by the National Institute of Biological Plant Protection (Krasnodar, Russia) in field trials. In these trials the second spraying increased the antidote effect of Albit to herbicides on winter wheat by 8% compared to a single using. Often, herbicidal stress leads to dramatic increase of plant sensitivity to leaf infections. Albit, applied together with herbicides, compensates stress effect of the herbicide and immunizes plants against diseases (powdery mildew, brown rust, different spots, etc. ), that excludes necessity of additional fungicidal treatments. According to data of All-Russia Institute of Plant Protection (2004), All-Russia Flax Institute (2003), Agraricultural Scientific Institute of South-East (2004), Soil Institute and Kursk Regional Plant Protection Station (2001-2002), Vladimir Regional Plant Protection Station (2003) and others, application of Albit together with herbicides is able to considerably decrease following infestation of plants with leaf and stem infections, whose development is common event after treatment with pure herbicides. Antidote effect of Albit is particularly noticeable during using biostimulant with herbicides on cereals in EC stages 20-29(in particular, after overwintering of winter crops). Plants, weakened by overwintering, herbicide, root rots, react on Albit treatment by significant yield increasing. The high effectiveness of such mode treatment was demonstrated practically on winter wheat and other cereals (Zolotaya Niva LLC (Stavropol territory), Chapaev breeding farm OSC, Kuban cattle farm, Niva collective farm, trials of Kursk Regional Plant Protection Station), resulting in yield increasing up to 1 tonne/hectare (2001-2004). Let us consider to the main results of trials, where combined application Albit and herbicides was investigated. In Kursk Plant Protection Station and Kursk Scientific Research Institute trials on winter wheat (2001-2003) adding of Albit in tank mixture with herbicide based on tribenuron-methyl provided the highest yield increasing among trial variants (on average by 0.78 tonne/hectare), even when using increased herbicide consumption rate (20 g/hectare). Application of Albit on vegetation in the tillering stage in combination with herbicide based on mefenpyr-diethyl + amidosulfuron + iodosulfuron-methyl-sodium on the winter and spring wheat, spring barley provided the protection against powdery mildew with biological effectiveness 72.3-89.5%, yield increasing by 17-18.5% compared to pure herbicide treatment (farms of Klimovsk and Karachevsky districts of Bryansk oblast (2003-2004)). The Experimental and Production Farm "Kuban" of Gulkevich district of Krasnodar territory (2004) conducted the field trial, where herbicide based on 2,4-D (2-ethylhexyl) + florasulam was applied in combination with Albit (30 mL/ha and 50 mL/ha) for winter barley var. Paul at the end of tillering - the beginning of stem elongation stage. Barley yield in the control was 5.2 ton/ha, and when using Albit - 6.16-6.18 ton/ha. The yield increasing as a result of adding of Albit to herbicide compared to pure herbicide was 0.96-0.98 ton/ha (18.5-18.8%). On winter wheat var. Rufus (Ltd Agricultural company "Zolotaya niva" of Krasnogvardeisky district, Stavropol territory, 2003), Albit was applied once during vegetation in the tillering stage, simultaneously with the introduction of herbicide based on dicamba + chlorsulfuron, in control variant herbicide only was used. Yield in control variant was 4.81 ton/ha, the gluten content - 21.3%. Due to growth-stimulating activity of Albit and herbicidal stress effect reduction, Albit increased gluten content by 0.5%, the yield by 0.47 ton/ha (9.8%) compared to the control. In the trial of the Krasnodar Plant Protection Station, conducted in 2004 in farm “Rassvet” of Vyselkovskiy region on winter wheat var. Batko, Albit treatment in combination with herbicide based on dicamba + chlorsulfuron gave yield increasing of 0.32 ton/ha compared to the control (herbicide treatment). On the fields of farm "Kushchyovskoe" (Krasnodar territory, 2004) spraying with Albit of winter wheat var. Vita were conducted. Albit was used once during vegetation period in combination with herbicide based on 2,4-D + dicamba. Compared to the control (only herbicide application) treatment with Albit provided yield increasing of 0.46 ton/ha. Gluten content in grain increased by 4%. The trial of Vladimir Regional Plant Protection Station (2004) on the spring barley var. Zazerskiy-85 was performed in Suzdal region. Control is treatment with herbicide based on 2,4-D + dicamba (0.6 L/ha), experimental variant is tank mixture of the same herbicide + Albit (40 mL/ha). Spraying was performed on 6th of June (full tillering phase - the beginning of stem elongation). The biological yield in control was 2.11 t/ha, and in the version with Albit – 2.93 ton/ha. The yield increasing in the case of Albit application compared to pure herbicide was 0.82 ton/ha (28%). The aim of field trial conducted in National Institute of Plants Protection (2004) was to determine the anti-stress activity of Albit in the mixture with herbicide on cereals in the tillering stage. Field trial was conducted in the farm "Concord-Agro" of Ramon region of Voronezh oblast (village Yamnoe) on spring barley. In the field trial a new, highly effective herbicide containing two high-active substances (360 g/L dicamba + 22.2 g/L chlorsulfuron) was applied. One of these substances is also belongs to the class of highly toxic plant compounds (sulfonylureas). At the stage of tillering plants were treated with different doses of herbicide and herbicide in combination with Albit (30 mL/ha). The lowest (140 mL/ha), maximum (200 mL/ha) and increased (300 mL/ha) recommended dose of herbicide was applied. Herbicide based on dicamba + chlorsulfuron is recommended for controlling of dicotyledonous weeds, so it’s efficiency against monocotyledonous weeds, generally presented barnyardgrass (Есhinochloa сrus-galli) and foxtail (Setaria species) was low (5-26%). In the variant with dicotyledonous annual weeds: knotweed (Роlygonum lapathifolium, Рolygonum соnvolvulus), muchweed (Сhenopodium аlbum), green amaranth (Аmaranthus retroflexus), charlock (Sinapsis arvensis), cleavers (Galium aparine) either alone or in mixture with Albit demonstrated sufficient efficiency. Weed control was from 64 to 97% depending on the dose of the pure herbicide, and from 62 to 93% when herbicide combined with Albit. The tank mixture of herbicide based on dicamba + chlorsulfuron and Albit also did not reduce the effectiveness of pesticide in the suppression of perennial weeds. The effectiveness of treatments (weed control) against field sowthistle (Sonchus arvensis), milky tassel (Sonchus oleraceus) and blue lettuce (Lactuca tatarica) depending on the dose of herbicide and measuring ranged from 33 to 84% (herbicide) and from 34 to 81% (herbicide + Albit). With increasing consumption rate of herbicide, its effectiveness was considerably increased. The difference is especially considerable when comparing mass of weeds in variants with minimum and increased doses (56% of the surviving weeds vs. 33% control). However, despite a higher biological effectiveness, with increasing dose of herbicide, yield of barley with a dose of herbicide 300 mL/ha was less by 1.7 centners/hectare, than with a dose 200 mL/hectare. With rising dose of herbicide, increasing crop yield decreased from 15% to 8.6%. Analysis of obtained results revealed that Albit in a mixture with herbicide based on dicamba + chlorsulfuron almost had no effect on herbicidal properties of pesticide, but significantly reduced the retardant effect of herbicide on the main crop (barley). When addition Albit to herbicide, yield increasing was higher by 1.1-3.1 centners/hectare (4.1-11.6%) than using of appropriate doses of pure herbicide, moreover the effect increased with increasing dose of herbicide with active ingredients dicamba + chlorsulfuron (Fig. 4). In the control barley yield was 26.7 centners/hectare, when using herbicide based on dicamba + chlorsulfuron – 28.8-29 centners/hectare, herbicide with Albit – 29.9-32.1 centners/hectare. Due to the fact that Albit smoothed out stress effect of herbicide on the main culture, when using together Albit and herbicide, extra yeild was received up to 4-6 centners/hectare (compared to pure herbicide treatment). At the conclusion of VNIIZR, application of Albit in tank mixtures with herbicides is biologically and economically feasible and should be part of the technology of cultivation of cereals in the conditions of the Central Black Soil. High potential of the combined using Albit and herbicides was demonstrated in the Field Day in Orenburg region (2005) by the theme: "The main directions of production of high-quality wheat, barley, sunflower seeds based on technology of Plant Protection" (August 2, 2005). In the Field Day supervisors and specialists took part from the Regional Department of Аgricultural Сomplex, Orenburg State Agrarian University, Orenburg NIISKh, Orenburg VNIIMS, chiefs, main agronomists of regional managements of Аgricultural Сomplex, seed farms, chiefs of Plant Protection Stations, representatives of leading companies, providing of Аgricultural Сomplex by pesticides, as well as representatives of farms from 25 districts of region: Akbulaksky, Alexandrovsky, Asekeevsky, Belaievsky, Buguruslansky, Buzuluksky, Grachevsky, Ileksky, Krasnogvardeisky, Kuvadyksky, Kurmanaevsky, Matveevsky, Novosergievsky, Oktyabrsky, Orenburgsky, Pervomaysky, Perevolotsky, Sakmarsky, Saraktashsky, Sol-Iletsky, Sorochinsky, Tashlinsky, Totsky, Tyulgansky, Sharlyksky, from Orenburg. In the seminar Deputy Head of Administration in Orenburg region, the Director of the Department of Аgricultural Сomplex V.K. Eremenko took part. The Field Day participants were shown the experimental field plots setting in ZAO "Mayak" of Sol-Iletsk district by Department of Plant Breeding and Plant Protection in Orenburg Agrarian University. Spring wheat var. Albidum-188 was once treated in foliar spraying by different herbicides, as well as complex combinations of herbicides and growth regulators. In the field trials weediness (air-dry mass of weeds) was measured and based on it - biological efficacy of herbicides, as well as influence of treatments on yield of total above-ground air-dry biomass of wheat. Plot trials, treated by the most effective of the tested growth regulators – Albit, were attracted the general attention of participants of the event. In the field trials the most economically important for the region herbicides were tested (with active ingredient 2,4-D, dicamba + chlorsulfuron, 2,4-D + triasulfuron, metsulfuron-methyl + dicamba and 2,4-D + carfentrazone-ethyl). In spite of high efficiency of the tested herbicides against weeds, the yield increasing in variants with treatment by pure herbicides was quite low, and in two variants yield was less than in the control. Due to removing of stress effect of herbicides, their using together with Albit allowed in all cases significantly to increase yield of wheat (from 0.9 to 7.5 centner/ha compared to pure herbicides). More intensive growth of plants on plot trials, treated by Albit was visible by "the naked eye". This property of Albit is noted in variants with all tested herbicides in the field trials (Fig. 5). For example, when using herbicide based on 2,4-D + triasulfuron, yield was obtained 19.5 centner/ha, and when using a tank mixture Albit + herbicide, yield was 27.0 centner/ha (20.4 centner/ha in control). Thus, the biological effectiveness of herbicide based on 2,4-D + triasulfuron against weeds was 84% and its combination with Albit - 86%. Thus, the addition Albit practically did not reduce biological efficacy of herbicides against complex of weeds (Fig. 6). In variant with herbicide based on 2,4-D, Albit even increased the effectiveness of herbicide (from 24 to 45%). Variant with herbicide treatment is shown with red color (first bar), herbicide + Albit treatment is shown with green color (second bar). Using Albit together with herbicides based on clopyralid, haloxyfop-R-methyl and ethofumesate + phenmedipham + desmedipham in the conditions of Mordovia Republic in the northern border of sugar beet area, provides the planned yield of agriculture 400-600 centner/ha. In Tambov region Albit is included in the integrated system of sugar beet treatments by complex of herbicides of company "August" as an effective antistress agent, which allows to eliminate inhibition of plants growth. In the farms of Voronezh and Lipetsk regions (their pesticides supply is provided by the company "Agroliga Russia") when chemical weeding of sunflower crops, herbicide based on clethodim was shown a good efficiency (92%) at consumption rate 0.5 L/ha. Addition to this herbicide biostimulant Albit increased yield of sunflower on average by 10% compared with pure herbicide. Combination Albit with herbicides has been proven to be effective on fiber flax. In a field trial VNIIL, National Flax Institute (2003) the effect presowing seed treatment of flax seeds vs. A-93 by different herbicides (fungicide based on carboxin + thiram, Albit, mixture Albit with half-dose of fungicide) on flax product yield was studied. Regardless of variant presowing seed treatment, all variants of foliar spraying in the phase "firtree" were sprayed by mixture herbicides with active ingredient chlorsulfuron (0.005 kg/ha) + quizalofop-P-tefuryl (1 kg/ha) and by the same herbicides + 50 mL/ha Albit. In all variants with Albit treatment flax product yield was significantly higher (by 4-6 centner/ha) than using pure herbicides. The same regularity was confirmed in field trials VNIIL, National Flax Institute (2004) during herbicide treatment by the mixture of herbicides based on chlorsulfuron and quizalofop-P-ethyl (0.005 kg/ha + 1.5 L/ha). 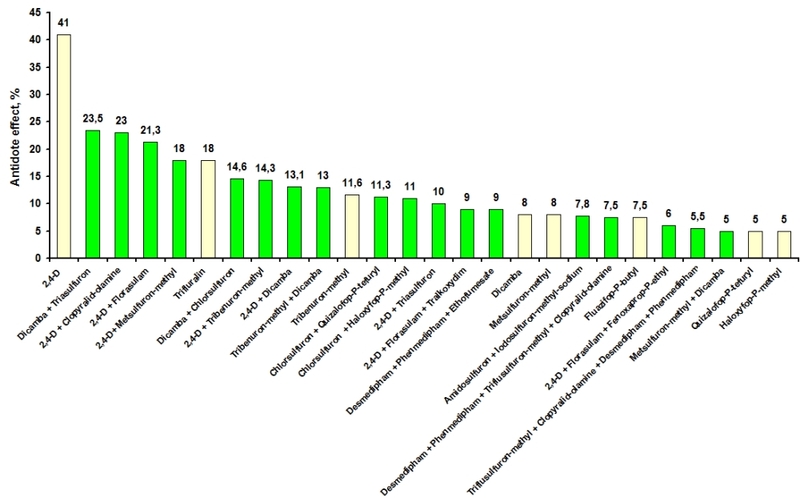 Addition Albit to these herbicides increased yield of flax straw on average by 3-6 сentner/ha. During field trial 2004, it was also noted that using Albit removed delay of phase growth of flax, caused by retardant action of herbicides (Fig. 7). As seen in Figure, in July 8 (2004) on field plot with herbicide + Albit treatment flush blossoming fiber flax had already observed, while using pure herbicides only individual flowers were appeared (Fig. 8). Nr. Active ingredient of the herbicide(s) Application rate of the herbicide used in the experiment, L/hectare (kg/hectare) Crop Yield, centners/hectare Yield increase in Albit/herbicide treated set over herbicide only treated set. Summarizing all datа about field trials of OOO Company "Albit", it can be concluded that using Albit together with herbicides due to antidote effect provides yield, which is higher (on average by 16.6%) than using pure herbicides. Thus, antidote effect substantially depends on active ingredient of herbicide (Fig. 7). 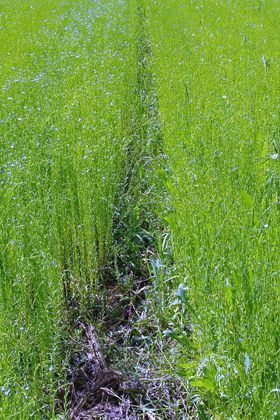 Currently, a high effectiveness of combined using Albit with herbicides was confirmed in long-standing field trials VNIIZR, NIISKh South-East, Krasnodar and Kursk STAZR, VNIIL (National Flax Institute), in practical using in farms of Lipetsk, Orel, Samara, Tula, Omsk, Rostov, Vladimir, Kursk, Tambov, Bryansk regions, Krasnodar and Stavropol regions, in Mordovia Republic on different agricultural crops (cereals, flax, sugar beet, soybean). The high efficiency of combination Albit with herbicides Cowboy, Lenok, Bagheera, Secator, Banvel, Logran, Chistolan, Difenzan, Granstar, Prima, Dialen super, Magnum, Fenizan, Oktapon extra, Vigosuron, Biathlon, Avroreks, Grench D, Pivalt and others was shown. The obtained results allow to recommend Albit for widespread using together with herbicides in agricultural practices.